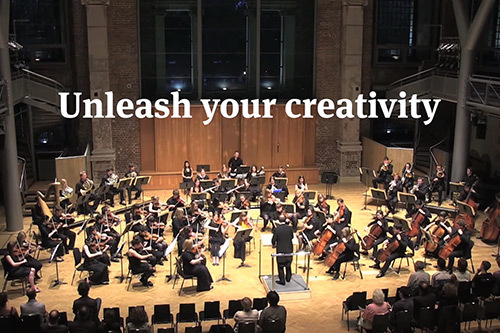 The unique student experience offered by the Department of Music at City University London has been highlighted in a stunning new video. Featuring student performances and footage of lessons and facilities in the department, the video showcases the advantages of studying music at City. The department, which is this year celebrating its 40thanniversary, combines world-leading research with exceptional teaching in performance, composition and musicology. Situated right at the heart of one of the world's greatest musical cities, it offers an inspirational environment with state-of-the-art facilities. The department’s research excellence was recently recognised in the nationwide Research Excellence Framework (REF) 2014, which rated 87 per cent of its research as either “world leading” (4*) or “internationally excellent” (3*). In addition, results from the 2015 National Student Survey (NSS) showed that City is now the top university in London for student satisfaction. The overall satisfaction rating for City is 87 per cent - the highest score the University has achieved since the results of the first survey were published in 2005.